Cabins for solitary retreat are available at Gampo Abbey for those who are interested in doing a retreat for a week or longer. 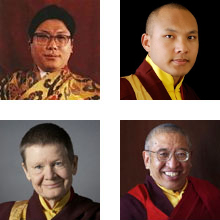 This practice opportunity is intended to support those wanting to deepen their study and practice of meditation. It is not intended to provide space for writing, music, yoga, martial arts, or to rest and recuperate. 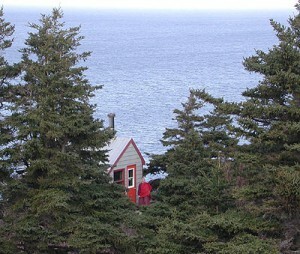 To qualify to do a solitary retreat here, you must be a member of a practice community and/or have a strong personal connection with a spiritual teacher. You must have completed one or more group retreat programs of at least two weeks. An established daily practice is encouraged. We require the recommendation of a spiritual teacher or meditation advisor. Anyone interested in doing a solitary retreat must fill out an application (Solitary-Retreat-Application) , which should be emailed to the Gampo Abbey office for consideration by the Head of Practice. A cabin will not be reserved until your application has been approved and a deposit of $100 ($200 if your retreat is more than 10 days) has been received by the Finance Office. Please make your deposit promptly to be sure you get your desired dates. As lead-time is needed by anyone planning to come here for retreat, we will only refund deposits for reservations cancelled up to 30 days prior to the start of the reserved period. If you need to cancel your reservation due to an emergency within the 30-day period, you may apply 75% of your deposit to a future retreat. Upon arrival at Gampo Abbey, please see the Finance Officer to pay cabin rental in full. Retreat cabins are $40, $60, and $75 CDN per night. Vegetarian food supplies, which are cooked by retreatants, are included. Each cabin has a kitchenette with a small refrigerator, bed with bedding, towels, table/chair, meditation cushions, and a shrine. The less-expensive cabins have outhouses. Showers may be taken in the main house at specified times. The $75/night cabin is more spacious than the others and includes a bathroom with shower. Basic shrine setup consisting of seven water bowls, two candles in votive holders, and photos of Sakyong Mipham Rinpoche and Chögyam Trungpa Rinpoche. Some cabins have a rupa or a thangka. Additional candles, incense, juniper, and charcoal can be purchased at the Gampo Abbey Bookstore. If you need a special shrine setup, it is recommended that you bring it with you. In accordance with Gampo Abbey policy, no meat, garlic, or onions are permitted for retreatants. Exceptions may be made in the case of eating meat for medical reasons only if pre-approved by the Head of Practice. Retreatants should bring any medication or dietary supplements needed. There is no smoking on Abbey grounds. Solitary retreats are solitary in that there is no contact with other Abbey residents or personnel other than the Practice person. All Abbey residents are informed of ongoing solitary retreats and are instructed not to interfere with retreatant boundaries (not speaking, not visiting, not hiking with, etc.). We welcome your interest to enter solitary retreat at Gampo Abbey and hope to hear from you! Please let us know if you have any questions.